The purpose of the Red Riders is to support everyone who lives with type 1 or type 2 diabetes and showcase the courage it takes to live every day with this difficult disease. It's time to celebrate those with diabetes that get on their bikes and ride! The Tour de Cure recognizes riders with diabetes as the heroes on the day of the event! That YOU are not alone! You can ride and thrive with diabetes! With hundreds of riders who may share a similar story, and hundreds more to support you, being a Red Rider can help with your first mile or your millionth - in your fight to live a healthier life! Riding your bike is a great way to stay in shape and exercise is extremely important for everyone with diabetes to better help manage the disease. HOW DO I BECOME A RED RIDER? If you have type 1 or type 2 diabetes you are eligible to become a Red Rider. All you need to do is register for the Tour de Cure as a Red Rider. You will receive FREE recognition gifts on the day of the event such as a Red Rider Jersey*. *Event fundraising minimum must be met. IS THERE A NATIONAL TEAM I CAN JOIN WITH OTHER RED RIDERS? YES! You (and those that support you) can join Team Red, which is made up of Red Riders AND those that support Red Riders. 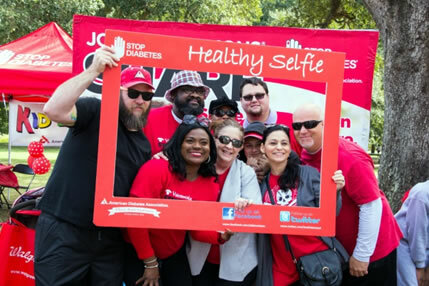 Anyone without a team should join Team Red and you will instantly be a part of the greater diabetes community. If you are already part of a corporate or family team you can stay on your team and still be recognized as a Red Rider. ...is for EVERYONE! Any rider who isn't already on another team and is looking to join with millions of others that want to Stop Diabetes can join Team Red. Red Riders (participants with type 1 or type 2 diabetes), their family, friends are also invited to join the team! ...that you will instantly be a part of a community made up of people from all different areas and walks of life. Team Red is a great way to connect with other riders to include families supporting a Red Rider or that are honoring a loved one with diabetes.